The bananas in the fruit basket are overripe and I’ve been wanting to try a banana muffin recipe that calls for ground oats and flax instead of flour, and honey instead of sugar. I added chia seeds to the recipe because…well, I had them in the cupboard and I like them. 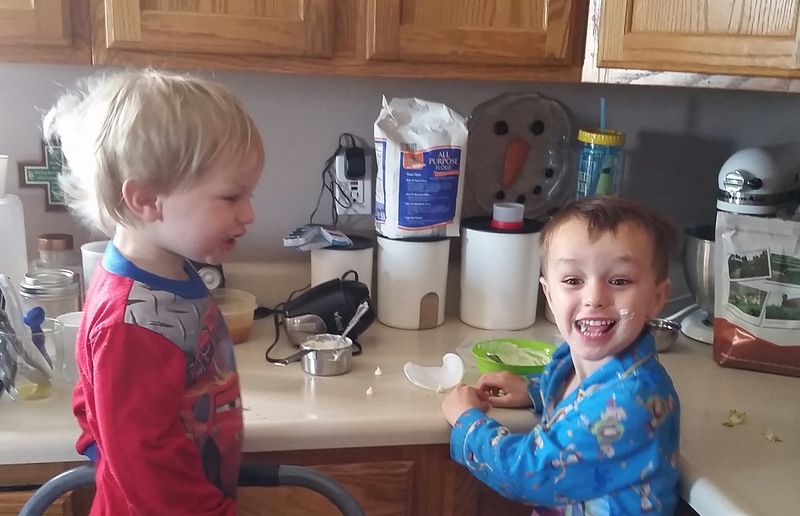 The boys love to help in the kitchen, so I got out the step stools and we spent 30 minutes mixing the batter. 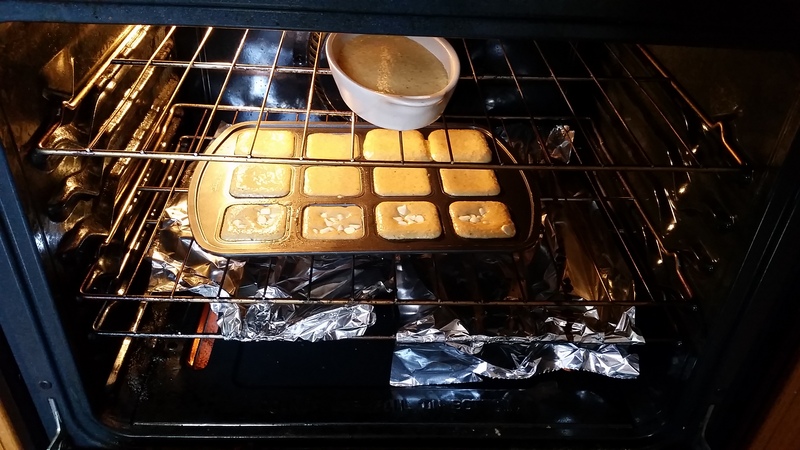 Normally, I’d whip it together in under 10 minutes but I wanted to incorporate a little math in the muffin mix, Plus, with little helpers, baking always takes much longer than usual. We measured ingredients–2 1/2 cups of oats, 2 tsp of vanilla, etc–and counted as we poured them into the food processor. We set a timer and counted the seconds it took to process the oats to a coarse powder and then how long it took to mix all into a smooth batter. And, we counted how many muffins the mix made. They have both been taking a beginning Spanish class through the park district so, sometimes, they counted in Spanish. “One, dos, tres,” and so on. I slid the muffins into the oven and set the timer, thinking that we’d do a word game while the muffins baked. Joe, however, had other plans. He decided to make a “special surprise”. 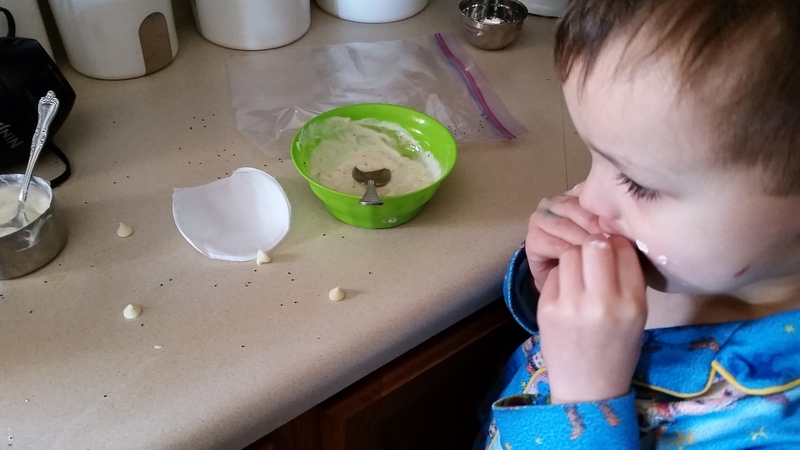 He loves plain Greek yogurt, and wanted to “mix stuff in” to make a parfait. He stirred in honey and white chocolate chips. I added the chia seeds that Jake had spilled all over the counter. “Mix, mix, mix,” he chanted. He tasted it after each addition and, when he was satisfied with the flavor, he thanked me for added the seeds, took the bowl over to his little table and dug into the “special surprise” he had made…for himself. “Mmm. This is good!” he exclaimed, holding up a spoonful for me to taste. And you know what? It was good.